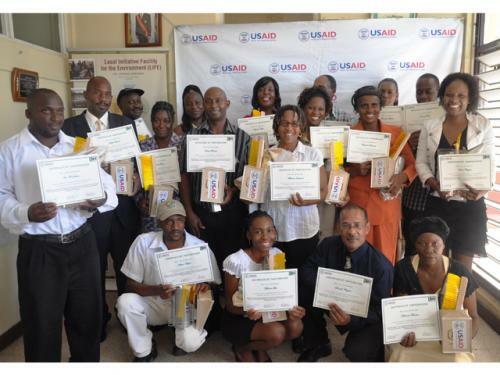 The Local Initiative Facility for the Environment (LIFE) held its second St. Catherine Beekeeping Group graduation ceremony on Monday, January 9, 2012 at the Rural Agriculture Development Authority (RADA) offices in Linstead, St. Catherine. The project is funded by the United States Agency for International Development (USAID) Jamaica as part of a project to develop community-based micro-enterprise in five parishes. The St. Catherine Bee Farmers’ Association selected twenty candidates for training from communities in the parish. Eighteen trainees graduated from the eleven-week course and received certificates and equipment to start their own bee-keeping enterprises. On March 14, 2011, USAID/Jamaica and LIFE signed a US$750,438 (J$64.6 million) co-operative agreement for the implementation of a community-based micro-enterprise development project, which will develop or expand 161 agriculturally based micro-enterprises and two bee-keeping organizations in twenty-five communities, through the application of bee-farming, protected farming and agro-processing activities, over a three-year period. The bee-keeping industry has the potential for significant return on investment. This project will provide direct employment for a minimum of 210 persons and indirectly impact over 1,000 residents and many beekeepers island-wide. “I changed my lifestyle for the better and this course taught me a lot about bees and how to care for them,” stated Mr. Hollis Rhodd, a graduate of the program, who went on to stress the significance and the positive impact of the training. Executive Director of LIFE Ms. Velva Lawrence encouraged the trainees to make good use of the opportunity and to become successful bee-keepers. The course included instruction in several areas including hive management, pests and diseases, and micro-enterprise. One of the graduates, Parish Manager of the Jamaica Agricultural Society (JAS) Ms. Cardia Duhaney, lauded the program for its relevance to community development and individual empowerment. 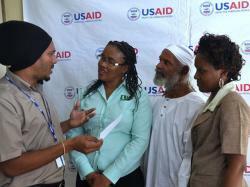 “I intend to pass on this knowledge to others,” she told fellow graduates and representatives from LIFE and USAID. USAID funding for microenterprise projects under its Development Grant Program since September, 2010 has totaled US$4,725,956 (J$406.9 million). The aim of the micro-enterprise interventions is to empower Jamaicans in marginalized communities to generate income and to promote sustainable development.